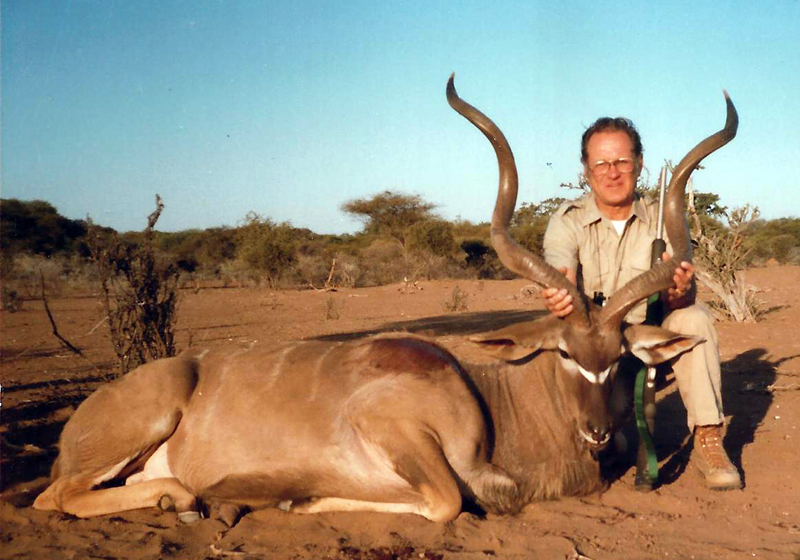 Founder of Brown Precision, the late Chet Brown, with one of his many African trophies. When Chet Brown pioneered the concept of a fiberglass rifle stock in the early 60's, he had little idea of the impact his new creation would have on the direction of the firearms industry a quarter of a century later. Brown's "synthetic stock revolution" first gained a following with benchrest shooters who welcomed the idea of having a stock that was absolutely stable in any weather or climate and much lighter than wood. But it was the hunter who would ultimately reap the greatest benefits of Chet Brown's new lightweight technology. Brown Precision can build an extremely accurate hunting rifle weighing under 6 lbs, that will consistently outperform traditional wood stocked rifles 3 or more pounds heavier. Brown further bucked tradition by replacing standard blued metal with stainless barrels and hi-tech rustproof metal finishes such as electroless nickel and Teflon for all weather performance; and using shorter barrel lengths and thinner barrel contours for easier handling and weight reduction. The resulting Custom High Country and Pro Hunter series hunting rifles are known to be the lightest, toughest, most accurate, reliable and indestructible hunting rifles available. 1965- Invented Fiberglass rifle stocks. The first synthetic rifle stocks on the market. 1966- Utilized materials and techniques in glass bedding used in benchrest competition. These same materials and techniques were later used in hunting rifles and are still most commonly used today. 1968- Pioneered precise action machining techniques commonly referred to as "blueprinting". 1968- Started using match grade stainless steel barrels on hunting rifles. 1968- Benchrest quality chambering techniques used on hunting rifles. 1969- Perfected the "recessed target crown" still in use today on most benchrest rifles, many custom rifles, all Brown Precision custom rifles, and even many production rifles. 1974- Started producing Kevlar rifle stocks. Brown Precision was the first company to manufacture stocks using Kevlar. Today, most people claiming to use Kevlar are actually using a very small amount, strictly for the purpose of using the name. 1977- First custom gun builder to use high tech weatherproof metal finishes on hunting rifles. Since these early finishes, many advancements have been made and Brown Precision has been at the forefront of research and development. 1980- Developed the use of graphite (carbon fiber) in rifle stocks. 1985- First custom gun builder to use 8 x 40 base screws in rifles. The extra strength of these screws has been realized and are now commonly used in other custom guns, as well as some production guns. In addition to these, many other materials and techniques have been tried and rejected. There have been many more failures then successes. It is because of the failures, not the successes, that Brown Precision has been able to stay at the forefront in this industry. Our research and development is quite extensive. You have our word we will not bring anything on the market, or offer anything in our line, until we are confident it works. We aren't concerned about making a quick buck. Instead, we want to continue bringing you only top quality products. By setting our standards so high, you can be sure that will happen.